1. Stone/dirt path scramble, muddy Converse and I’m chasing rubble: mad crumbled buildings in this town, falling like trash down the mountainside, and the urban explorer/trespasser in me can’t get enough. Guy sitting on his stoop—track suit and cheap sunglasses, smoking what smells like weed. Give him a nod, which I can’t tell if he returns. He nods. “Nice castle,” and juts his chin towards the stone mass in the distance. 2. Cobbled road in the old town, forty-five degree angle and I’m taking it slow. Pass an old dude I saw down in the new town—has one of the most intense shoe-polish toupees I’ve ever seen, hanging over his forehead like a black awning. I recognize him and he recognizes me—our eyes meet and I smile, nod. He smiles and asks me something in Albanian. He nods and throws a barrage of Albanian at me. I shake my head again. He points to his ring finger, then me. I laugh, wave my hands no. A woman appears at the window of the meat market we’re standing in front of, her face obscured by the glare on the glass. Our eyes meet and I smile. I’m scrounging the last sunlight of the day, before it slips behind that mountain and casts everything in a funny pink glow. I look up from my book and nod. 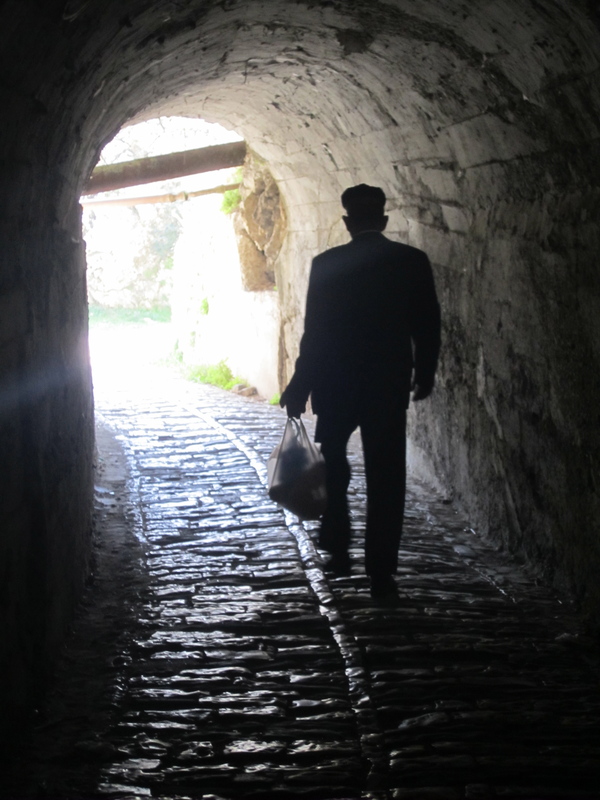 His name is George, he served me my espresso in the sinking light—he asks me where I’m from and if I have friends in Gjirokastra. He asks me if I have a mother and father back in the States, brothers and sisters—he asks me if I have a job, and I say no, and he asks why, and I say I quit. I tell him I’m a writer. I don’t think he understands. I give him the usual answer: that my friends either don’t have time or don’t have money, so I travel alone. I give this answer regardless of language barriers, because the real answer is harder to explain. Most of time, I don’t think I know the real answer. We try to chat, but it’s awkward and fails, and then the light is gone. So I smile and nod at my empty espresso cup and ask how much. He shakes his head. “Nothing. 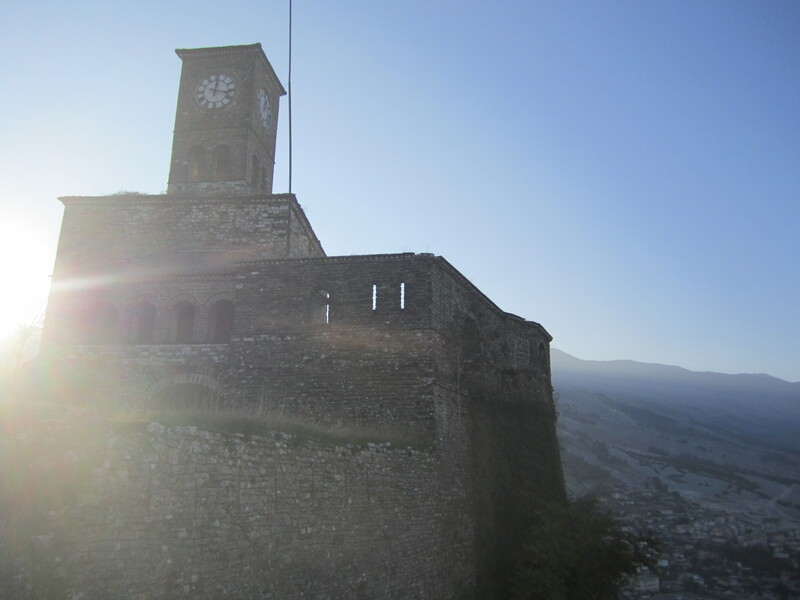 Now,” big broken smile, “you have a friend in Gjirokastra,” and points his thumb to his chest. Battambang is a dingy balcony over a deserted street. 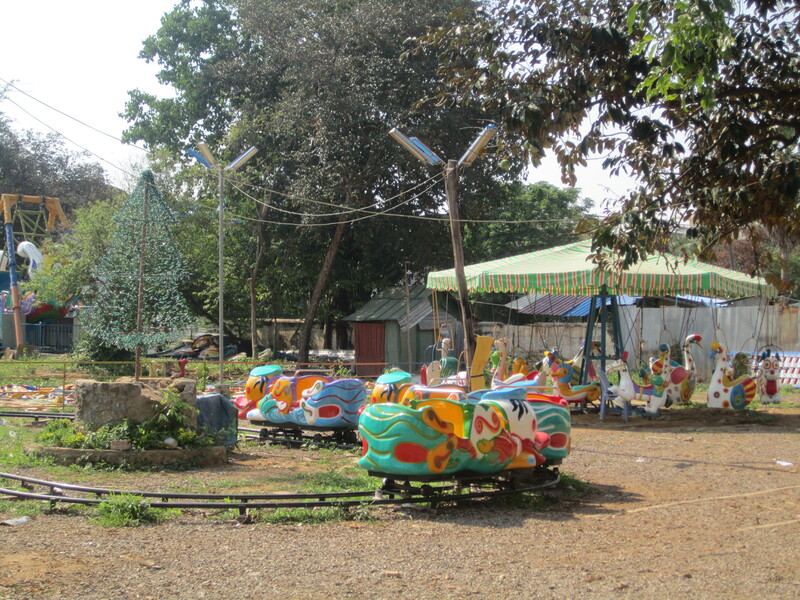 Battambang is a tangle of electrical wires sagging in the heat, is a patch of sand between busted-up sidewalk, is discarded amusement-park bumper cars fading in the sun. Cambodia’s fourth largest tourist attraction felt post-apocalyptic when we arrived, mid-afternoon during the biggest day of Khmer New Year. We wandered through nameless, signless streets, past shutters and padlocks and beach umbrellas with no one under them, looking for a guesthouse. 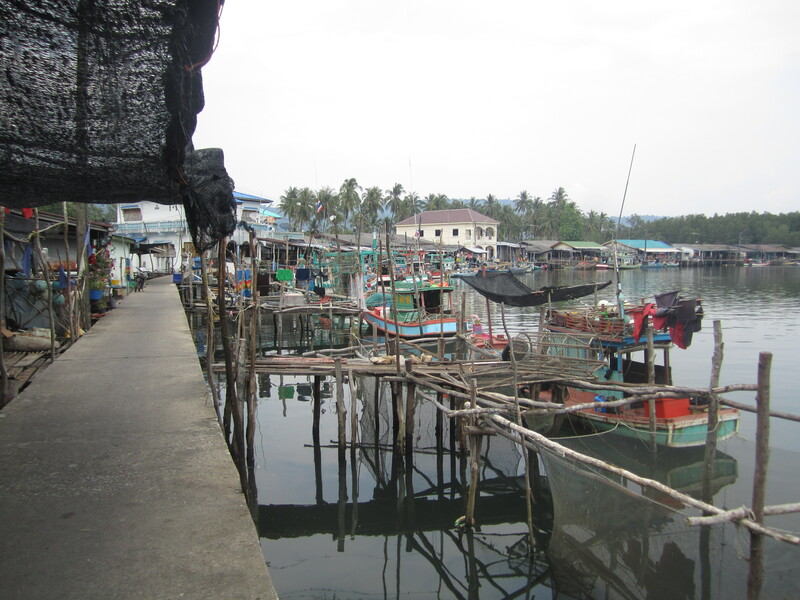 We ventured out for coffee, through the wilted market, strewn stalks of sugar cane and vegetables rotting in the heat. The open lot across from the evening carnival, sleeping in the mid-day sun, reminded me of an old Freddy Kueger movie, dogs sniffing around the menacing clown smiles on the front of bumper cars. While this impression isn’t entirely accurate—it would be like coming into any US city on Christmas Day—it did prove an apt opening to two days of wandering around the city and its surroundings. Battambang was, I’d learned, a major hub for people making the journey to Thailand in the post-Khmer-Rouge days, where they’d trade gold and hire shady guides to lead them through forests and mountains, landmines and bandits, that only some would survive. It’s probable that my friends’ parents passed through Battambang, and my friend, in a sense—in utero, sleeping inside the warmth of his mother. It was hard with the holiday to get a sense for the city as it is today. And the coolest stuff we found wasn’t the temples, where monks chanted into megaphones, and it wasn’t the bamboo norry trains that have now turned into a shameless tourist trap—a police man with a crooked smile and a limp handshake, “$5 per person.” The coolest places in Battambang were the abandoned ones. We walked down to the abandoned train station, a sweltering sidewalk lined with New Years decorations that look like tinsel pentagrams. 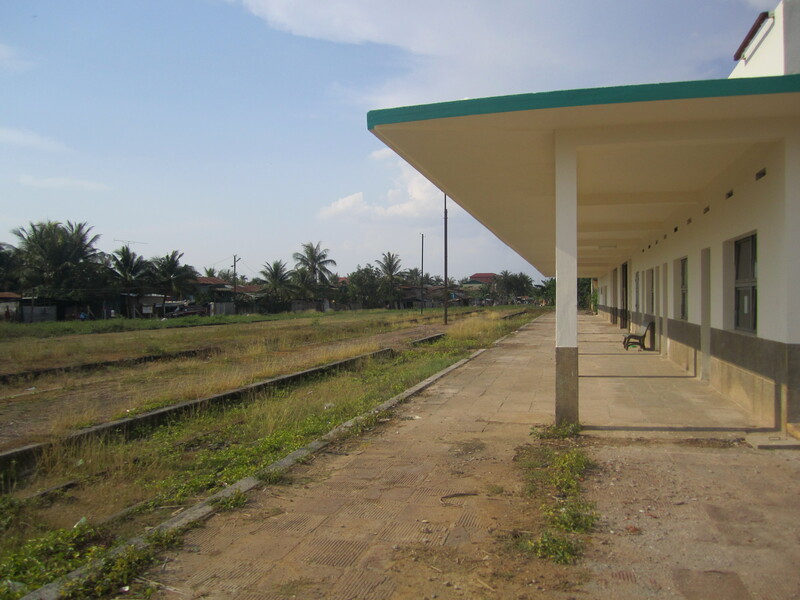 During colonialism, the French built a train system in Cambodia, and it was still used through the 70s. 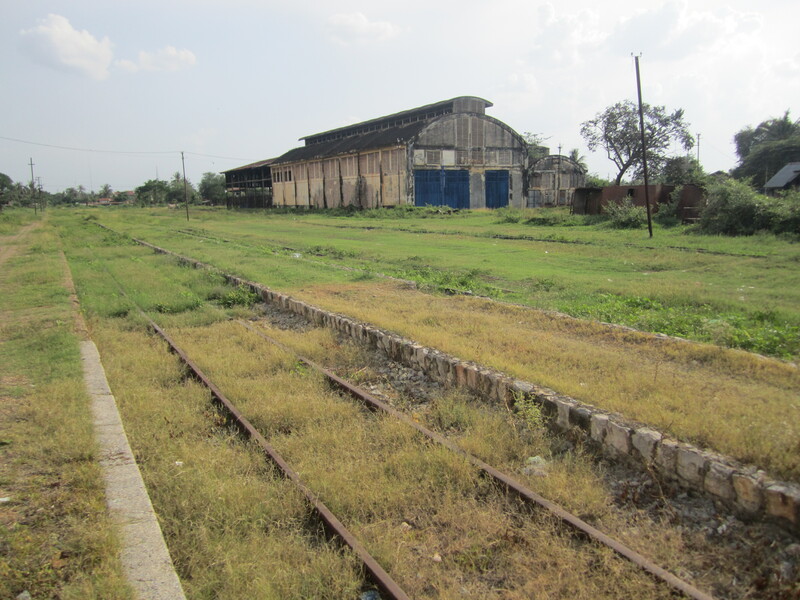 I’ve read accounts of people who, early on in the Khmer Rouge reign, were transported to various work sites by train. 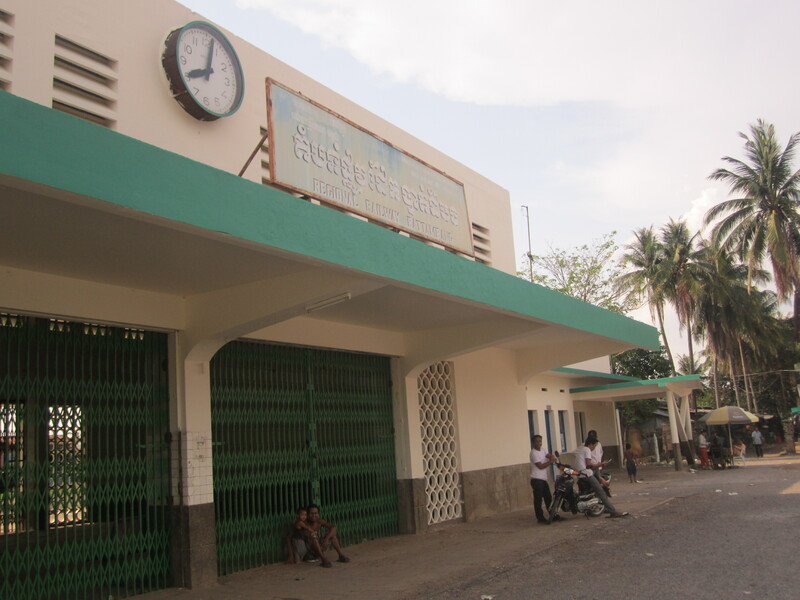 At some point the system disintegrated, and the Battambang train station is proof of it, the clock out front permanently frozen at 8:02—a time that comes twice a day, like a train passing, but a year and date that remain silent, that will never pass by again. 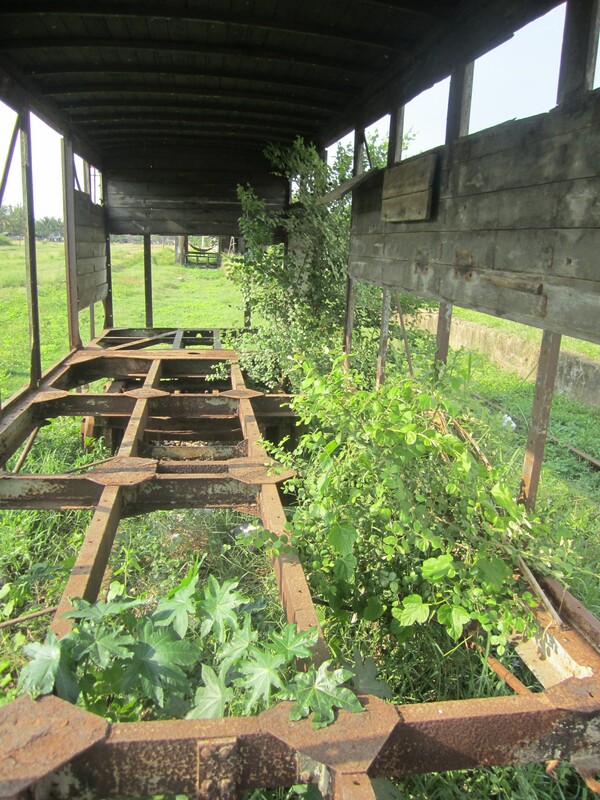 Like everything old in Cambodia, there’s nothing to stop you from poking around the lot of rusted engines, boxcar carcasses, tracks obscured by long grass and cow dung. People live there now, poor folks in thatched huts, where once the wind of the train might have blown them down, but now they only have to worry about the ghost trains passing—the wind, I suppose, doesn’t blow so hard from those. One man had set up a home in an old warehouse; I glimpsed him, through a crumble in the wall, bathing in his sarong. You’d feel funny walking through a place like that in any other country. In the US, it’d be dripping with graffiti and crackheads. But in Cambodia it was people just living their lives, sitting on bamboo platforms with their families, small children exclaiming, “Hello!” and giggling joyiously when we responded. You couldn’t help but feel welcome, though you weren’t sure why you were welcome, why they all greeted you so goddamn graciously. Something in me felt I didn’t deserve it. I smiled anyway. The next day I went out solo to explore the abandoned Pepsi factory. It’d been shut down, I read, when the Khmer Rouge came to power in 1975—frozen like that, like the clock at the train station. I grabbed a tuk-tuk, a man who insisted I pity him for having to work on New Years. We rattled out there, dirt roads lined with kids throwing small plastic bags of water, a New Year tradition. They smiled at me, waved, but none of them threw a bag at me. I wondered why. 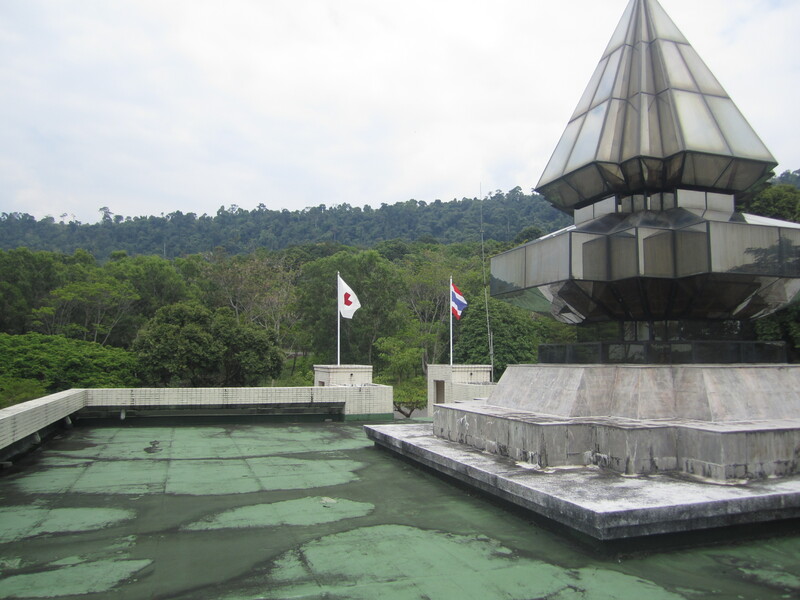 The Pepsi factory was a faded concrete building with a well-tended garden. It struck me as a curious juxtaposition—the crates of bottles I could spy through the windows, waiting for a delivery that never came; the burned-out remains of a warehouse further back, where a fire had once raged, fixtures hanging from holes in the ceiling; the barefoot children that wandered around, peeling back strips of corrugated tin and disappearing inside the blackness. All that, next to trimmed grass and perky flowers, a yard free of rubbish, where a couple of families picnicked in the shade of a tree. 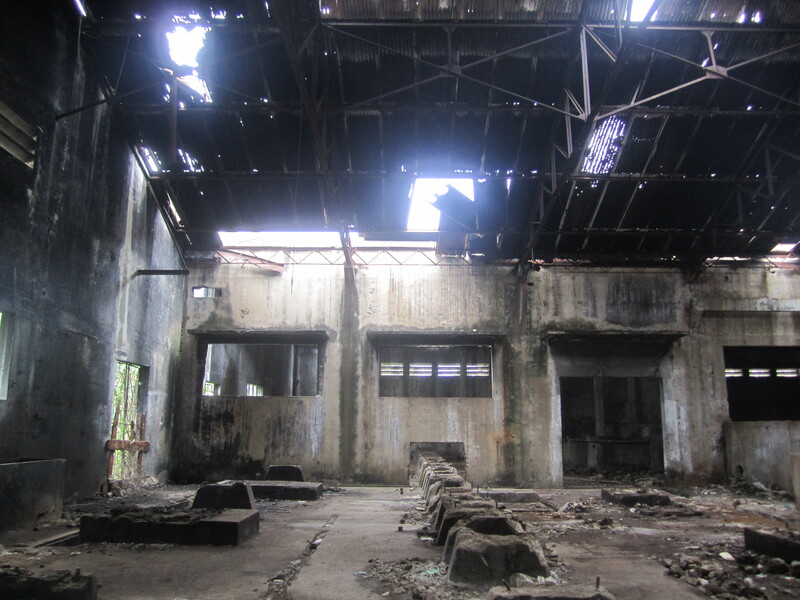 The factory, he said, had sat empty during the Khmer Rouge regime. When the Vietnamese came in 79, they’d dismantled all the machines and took the parts back to Vietnam. 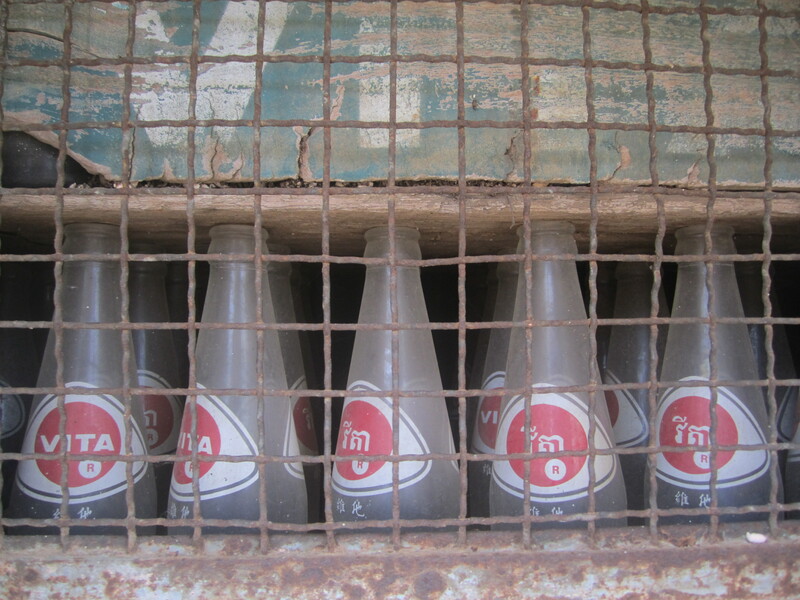 Now it was just crates of empty bottles, a silent loudspeaker with its wires disconnected, exposed. “Why is the garden so nice?” I asked him. “Oh, it’s a man who lives here. He’s very old, 80, I think. 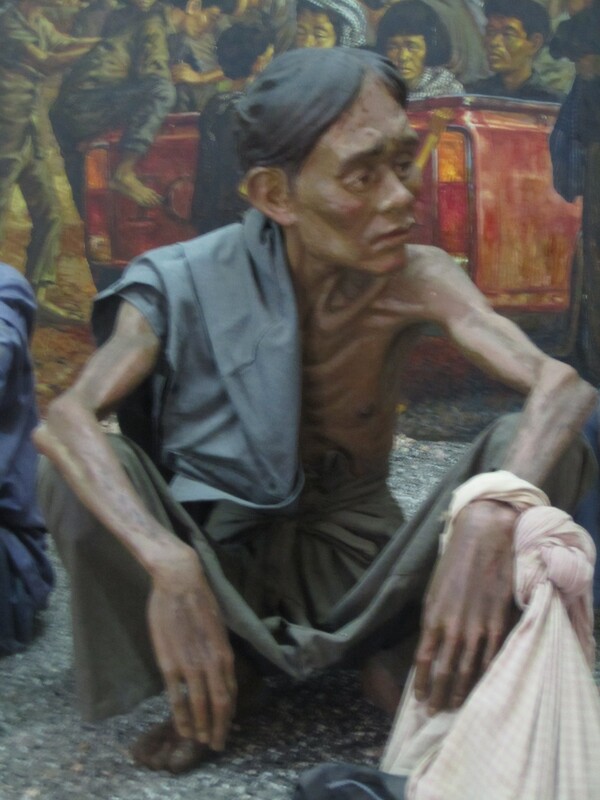 He used to work at the factory before the war. After, he had no family, nowhere to go, so he came back. The government let him keep the grounds. He lives back there.” He waved his hand back towards the burned-out warehouse, where I’d seen laundry lines and pieces of cooked rice sitting in the sun. “That’s him,” the tuk-tuk driver said casually, gesturing towards an old man who walked slowly with his hands clasped behind his back. 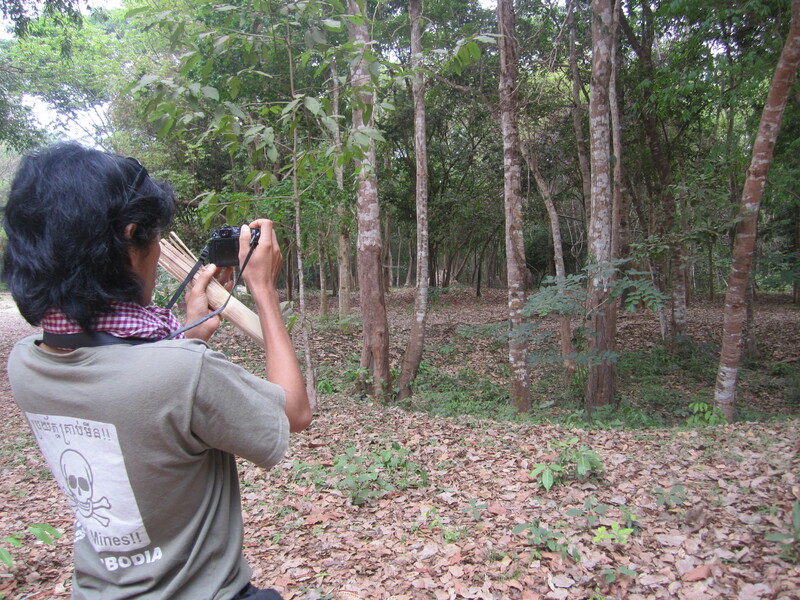 He wore an Angkor Wat t-shirt and a krama scarf loosely over his shoulders. You could tell by the way he sucked his mouth that there weren’t hardly any teeth left. The lines in his face were a fine webbing, like wrinkled laundry. I smiled and bowed for our awkward introduction. What do you say to a man like that?—a man who’d seen all those abandoned places alive, who’d lived it himself, who’d set up a home amid the ruin and spent his days tidying what was left, memories green as grass? 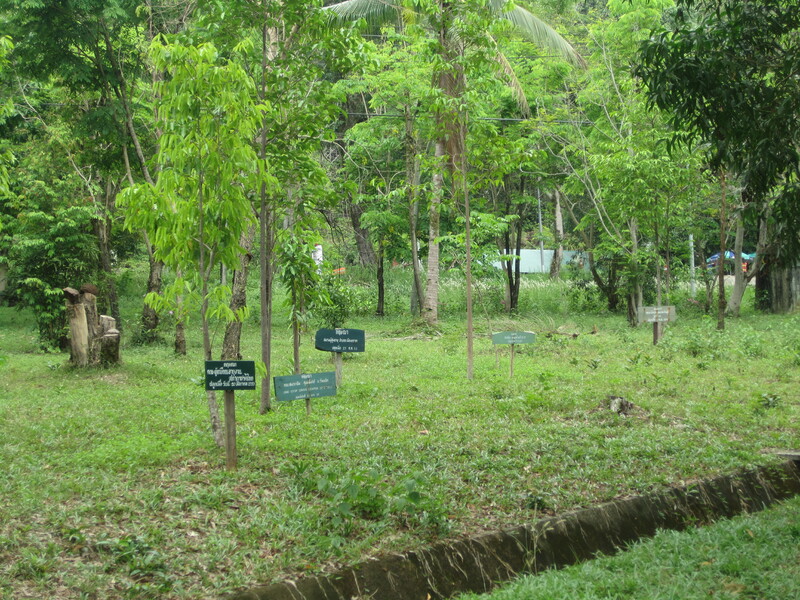 “The garden is beautiful.” The tuk-tuk driver translated and the old man smiled a sunken smile, no teeth to stretch it taut. I bowed again. 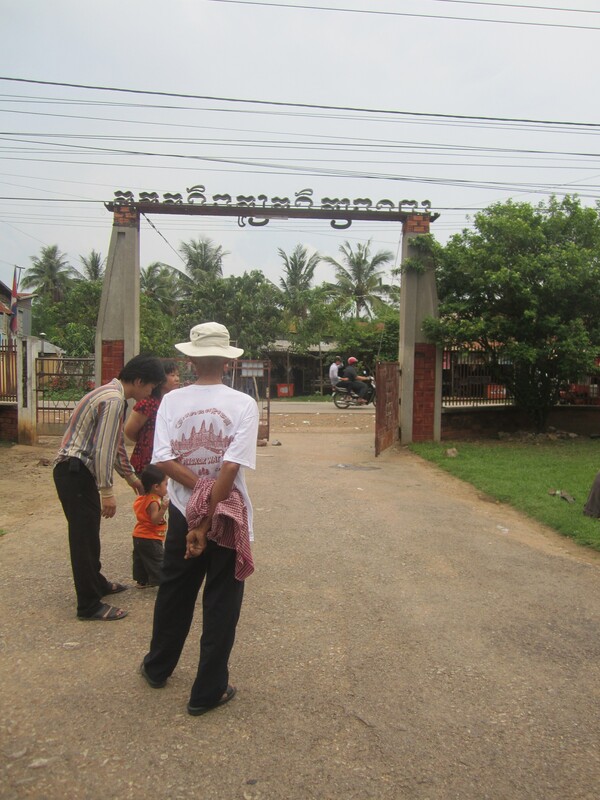 Battambang is a dirt road and a child waving, an old man nodding to himself as he walks away. The three little girls followed us like flies. They circled as we walked through the dirt and dry grass, holding out scarves for us to buy. It was my first trip out to the provinces. That’s what expats call the rest of country, everything that’s not Phnom Penh, and it’s a fairly accurate distinction: it’s like there’s two Cambodias, not just the surface and the underbelly that I wrote about before, but the urban and rural. The division goes a long way back. Before the Khmer Rouge, during the Lon Nol regime and the American bombings, the countryside suffered greatly—some million people are estimated to have died—while Phnom Penh remained a relative island of safety. 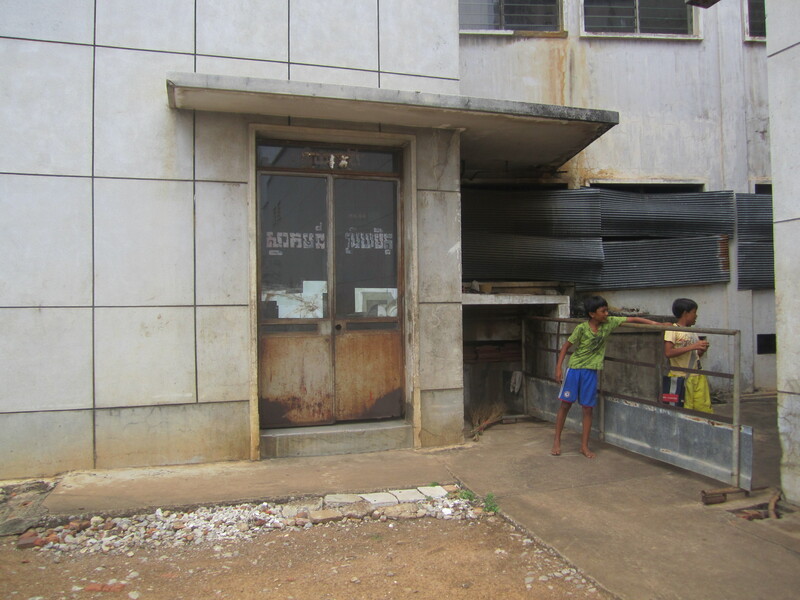 When the Khmer Rouge took over, they targeted urbanites, the so-called “New People.” A mutual distrust between city- and country-dwellers lingers. 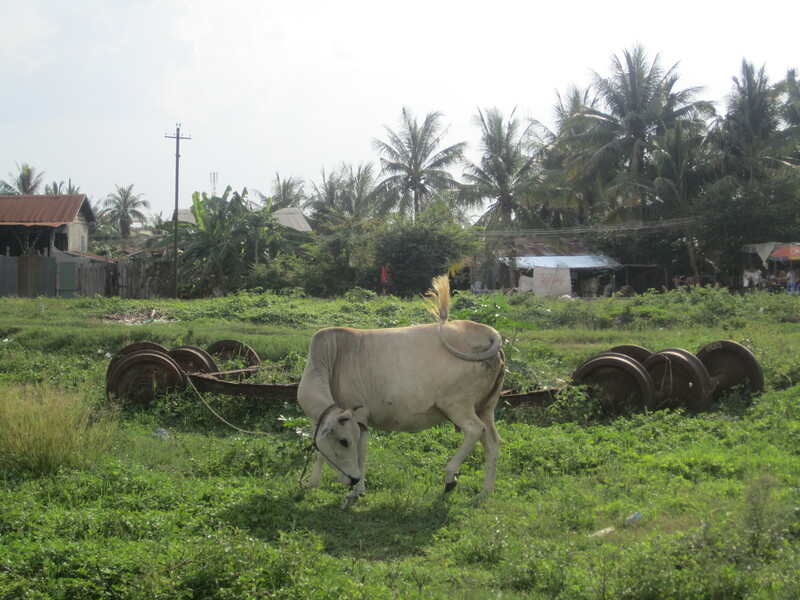 Still today, people in the countryside tend to be darker skin, pure Khmer, and largely uneducated, often living without electricity and running water. 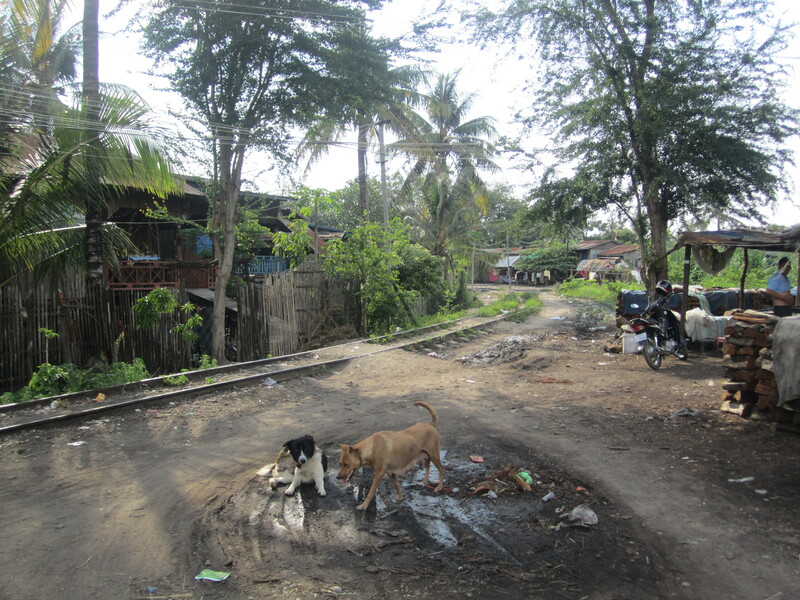 And while Phnom Penh is rapidly developing, construction cranes and billboards and the gleaming new riverside, the provinces remain fairly the same: dirt roads, thatch-roofed houses on stilts, naked children and water buffalo and chickens in the road. And a lot more of the scars of war. 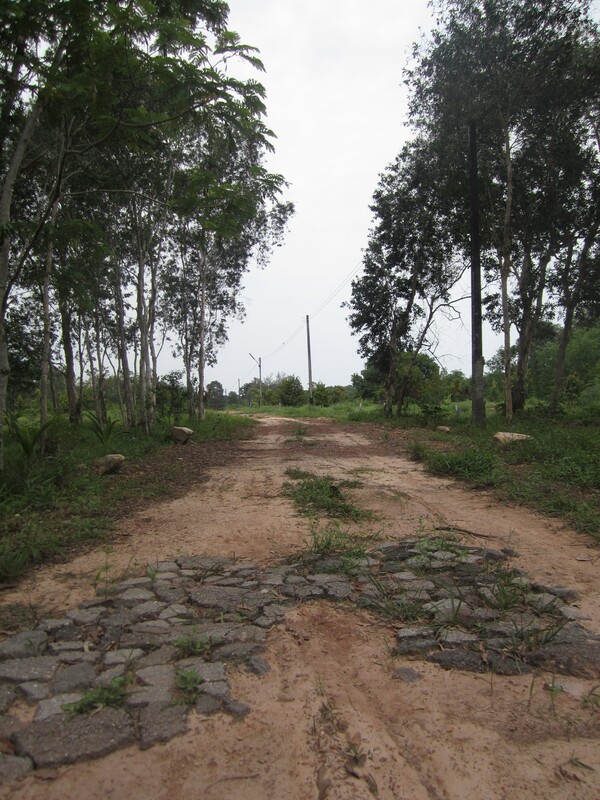 We’d headed out to the Kompong Thom province, 170 km along the “highway” to Siem Reap. 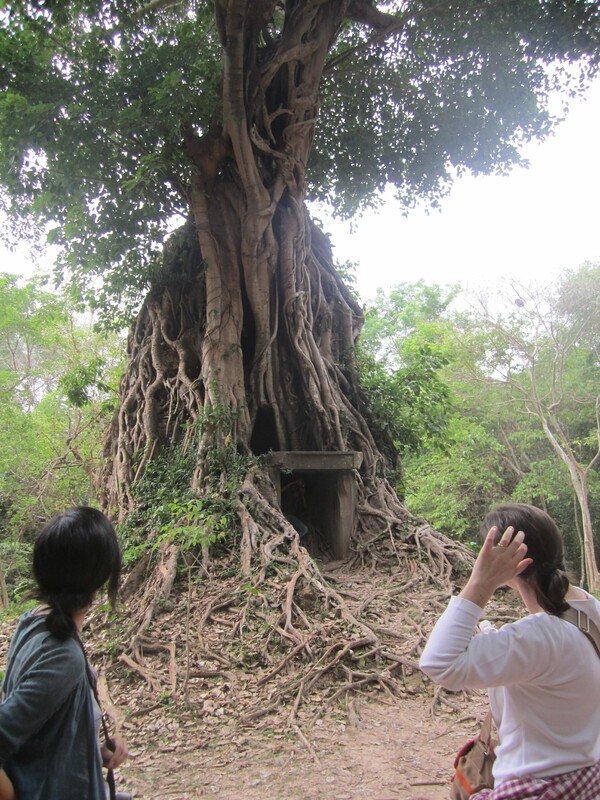 We were going to look at two things: the Sambor Prei Kuk pre-Angkorian temples, and bomb ponds. We found both, beside each other. I’d contacted Rattana Vandy about his exhibit Bomb Ponds, wanting to learn more. Although he lives in Paris now, he just so happened to be back in Phnom Penh, and invited me to come along with his wife and friend on an adventure to the countryside. 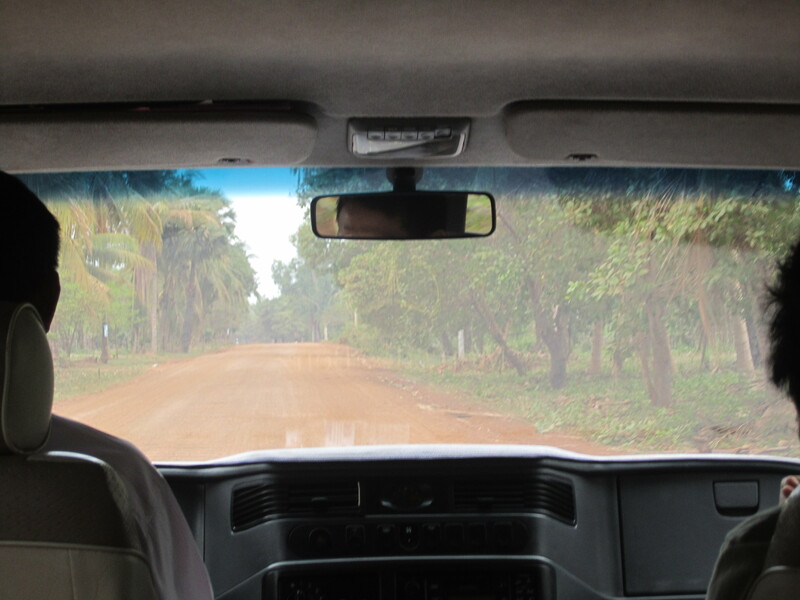 The drive was long, filled with stops for cashews and pomelo and tarantulas (which are surprisingly delicious). Three hours on the road and we arrived at the temple site. It was nearly empty, aside from a straggle of locals and the few huts they’d set up, selling bottles of water and chips. The little girls were on us; even after it was obvious we weren’t going to buy anything, they followed us, poking and playing with each other. There probably wasn’t much else to do. 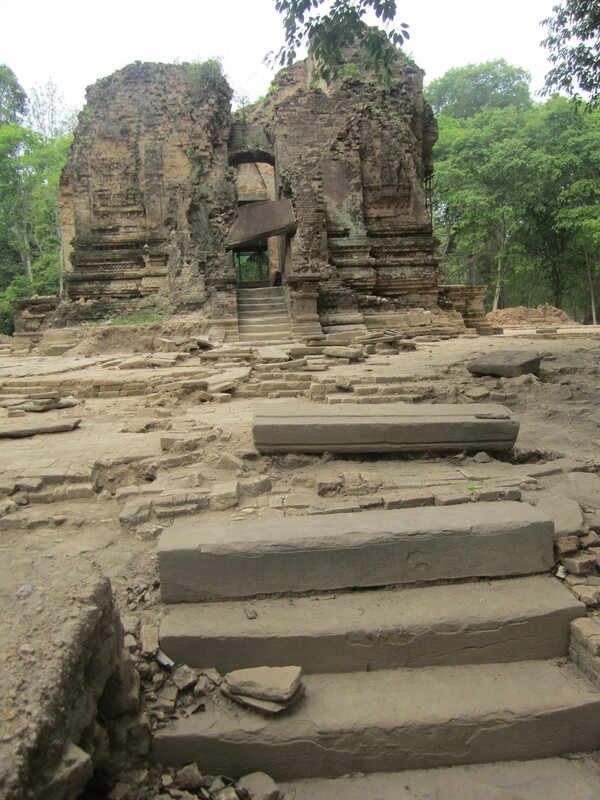 The temples were scattered around the shady dirt grounds. 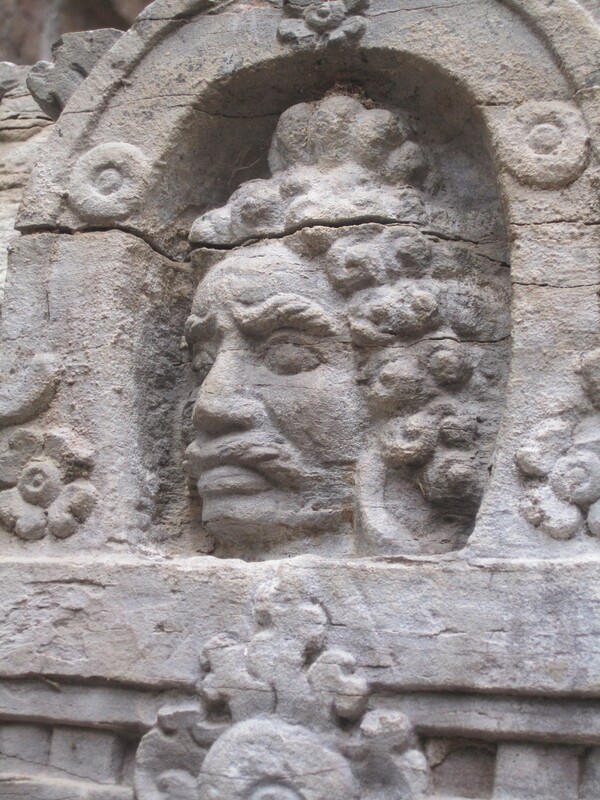 They’re pre-Angkorian, which means they were built between the 5th and 7th centuries, constructed of brick, with carvings in Sanskrit, odes to Hinduism rather than Buddhism. 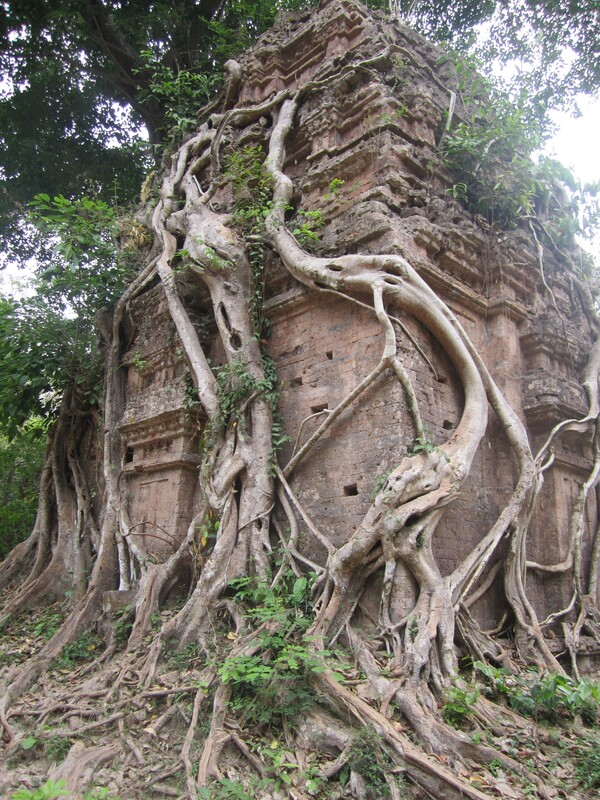 I hadn’t seen any temples yet, so I was easily impressed by the age, by the trees growing up and along them, like the vines were strangling the remains, trying to pull them back down into the earth. 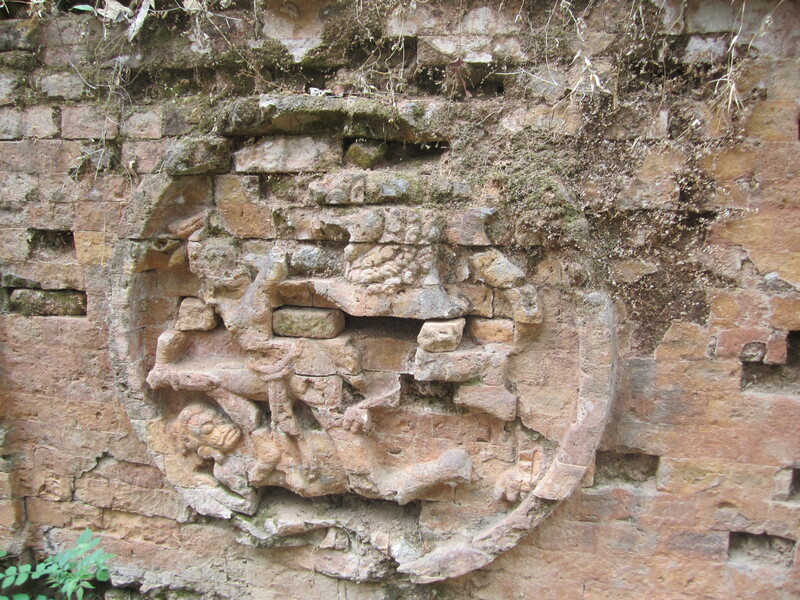 There’d once been some 200 temples at the site; only 40ish remained. I thought of the incredible luck that any of them had survived: the years, the monsoons, the looting, the gold diggings—and the bombings. Rattana had taught us how to spot bomb ponds. Unlike natural ditches, they’re perfectly circular. Because of the linear bomb-dropping pattern, they usually occur in a row, in certain intervals; you can count them out: “one, two, three…” The big ones are along the Vietnam border; the smaller ones, like these, were dropped from fighter jets and can be found all over the country. During the rainy season, they fill with water that even still, after 30+ years, has a lingering toxicity that makes it undrinkable. 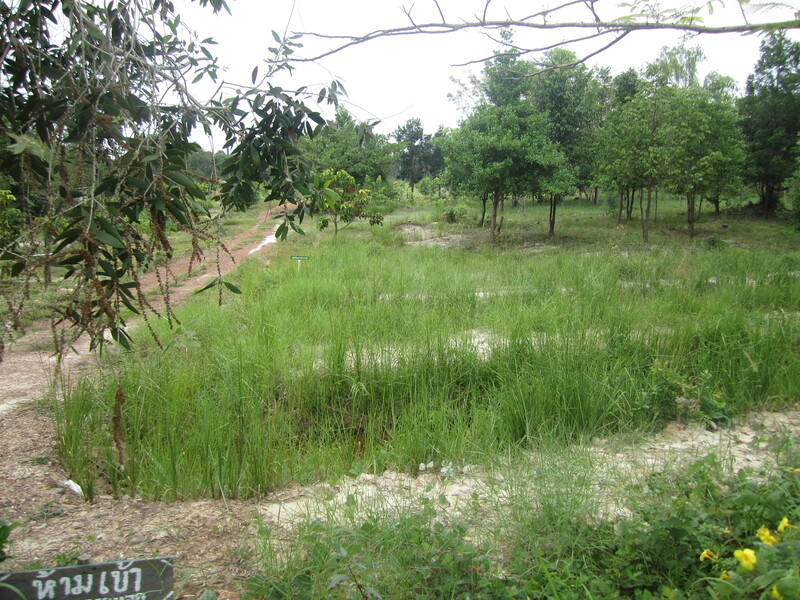 As it’s the end of the dry season, the bomb ponds now are just craters, sunken and waiting. They reminded me of pockmarks, the skin of a hard life—I thought back to Thailand, to its green, its rich-kid skin. A local man lingered around us, like the little girls but with less exuberance. 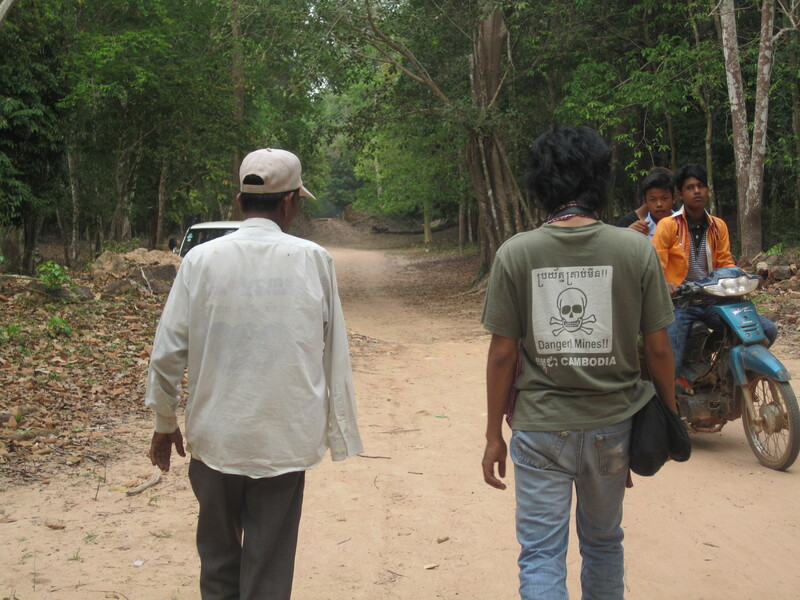 He began chatting with Rattana in Khmer, and wound up being our guide. He was knowledgeable, walked slowly, chiseled cheeks and a lean smile, salt-and-pepper hair swept into a comb-over, though he wasn’t balding. The lines around his eyes and mouth were thin, precise, deep and uncountable; they framed his mouth when he smiled, so that they seemed like smile lines. He was missing an arm. There was a nub somewhere inside his worn shirt, and he tucked things under it: his cap, his cigarettes. Sometimes when he walked, a slow and pensive walk, he held onto the empty sleeve as though he were clasping his hands. There was a tenderness to the gesture so palpable you wondered if it was his phantom limb he was holding—a dead hand, ghost hand, from another life that he was still clinging to, intertwined with, in the moments when no one was looking. How do you be American in this? “I wasn’t born yet” doesn’t seem good enough. “My parents were against the war” doesn’t either. Because these may be ruins, but it’s still happening, in other places; it’s still happening in this place too, the echo of it. You know, intellectually, that this echo lasts a long time, but knowing it and seeing it are two different things: You can hear something a thousand times and not know it, yet if you see it with your eyes just once, you know. 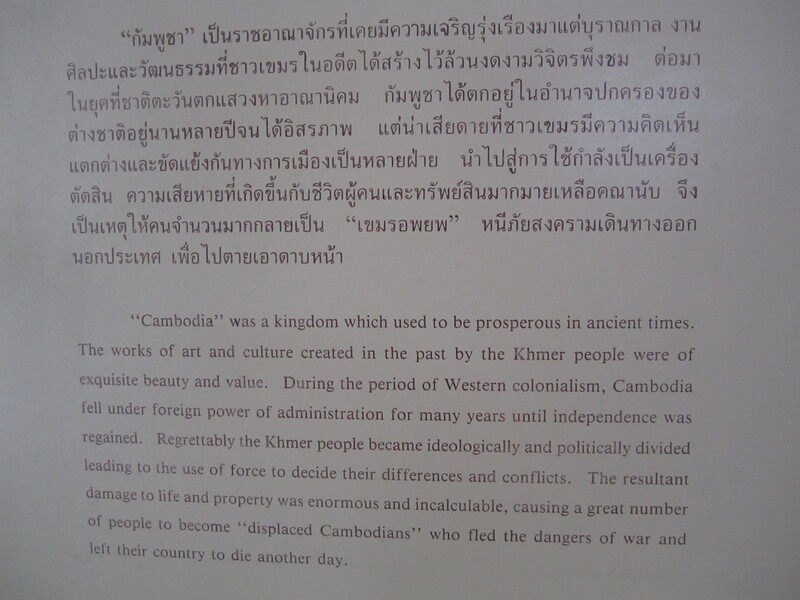 It’s a Khmer proverb, and it seems to be written for this place, the experience of being in this place. I thought, briefly, of bombs falling from the sky like small black parcels; I tried to imagine the blast and the sound, the rumble and heat. I couldn’t, not really—just project what I’d seen on old newsreels, aerial footage of impersonal explosions, reverse fireworks against dense green. I thought of how much was lost—lives and limbs and ancient temples, vacant of their gods—and how much remained, that any of it remained, even as scars, on the earth and in the bodies. I thought of what still stood, what still walked, and wondered how to be American amidst all this. Mai Rut. Mai Rood. You couldn’t even be sure of the name, and you sure as hell couldn’t be sure of the history. But it existed, that was the important part, and I was going to find it. I sat on the back of a motorbike and scanned the landscape. 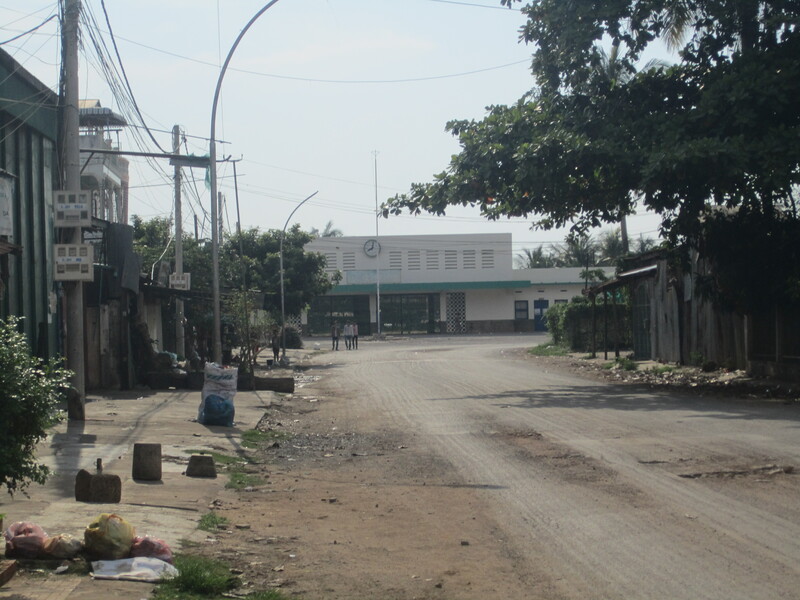 The town of Mai Rut was 5km from the main highway, and there’d actually been a motorbike driver, waiting on the platform in the shade for someone like me to set off a blue pick-up truck. Thailand was otherwise devoid of motorbike drivers; although a break from the constant barrage of “La-dee, moto-bike!” was refreshing, I kept finding myself needing a motorbike and finding none. But one appeared just when I needed it, and I suppose that’s how Thailand worked for me, how I’ll come to think of those three days spent along the border. And now I was there, or whizzing through there, and there was nothing but trees and grass and the odd clearing. 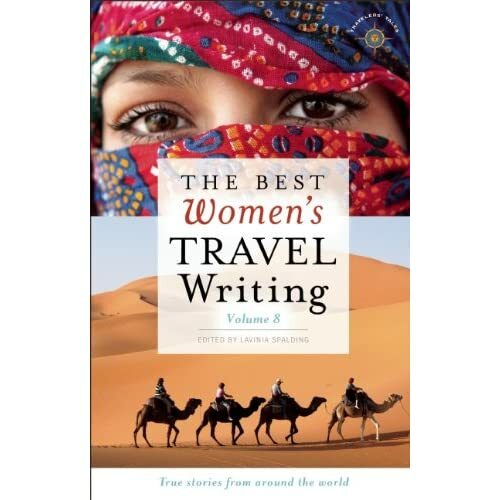 We moved too fast; I didn’t know how to tell the motorbike driver what I was looking for, or even to slow down, so I just let him drive, let us move through the landscape of lost stories. 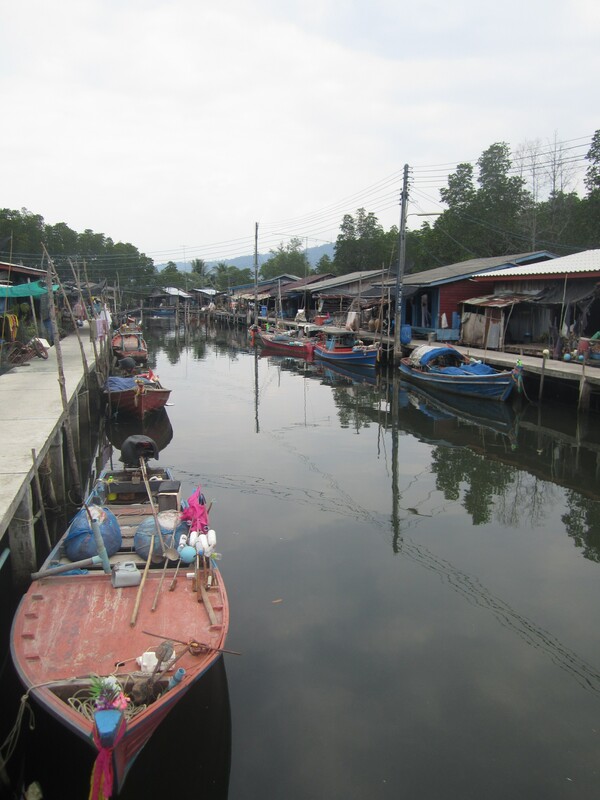 He left me off at the end of the road, where earth gave way to water and boats bobbed and nets hung, flies buzzing over sheets of fish and the smell of fish, fish, drying in the sun. 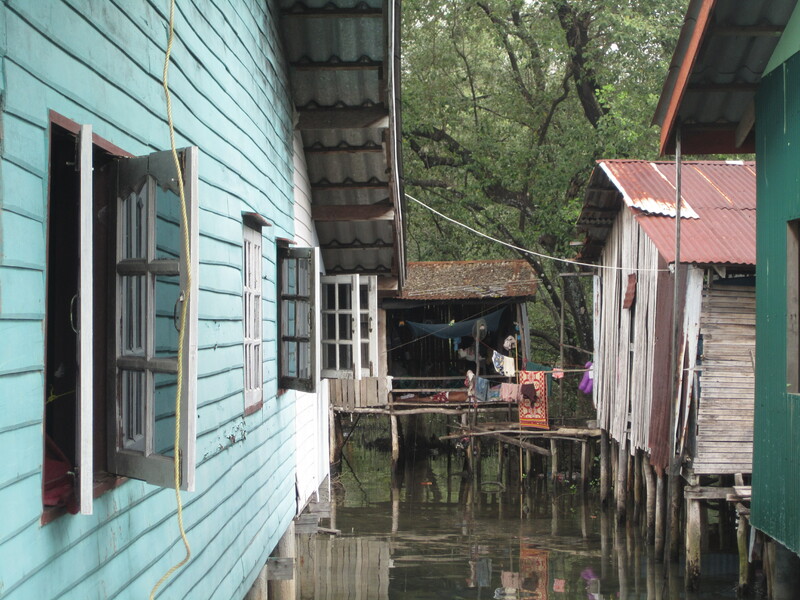 Houses stood on stilts and streets of cement had been made. This was the town, not the remains of the camp, which must have been somewhere outside of the town, fenced off by barbed wire the camera kept focusing on and off of, a beat-you-over-the-head kind of metaphor but a metaphor nonetheless, in a newsreel, which I could appreciate. This was not it, but it was the closest I was going to get. Mai Rood was a quiet little fishing town with not a lot going on. People sat in doorways. Children ran naked, grinned and disappeared. 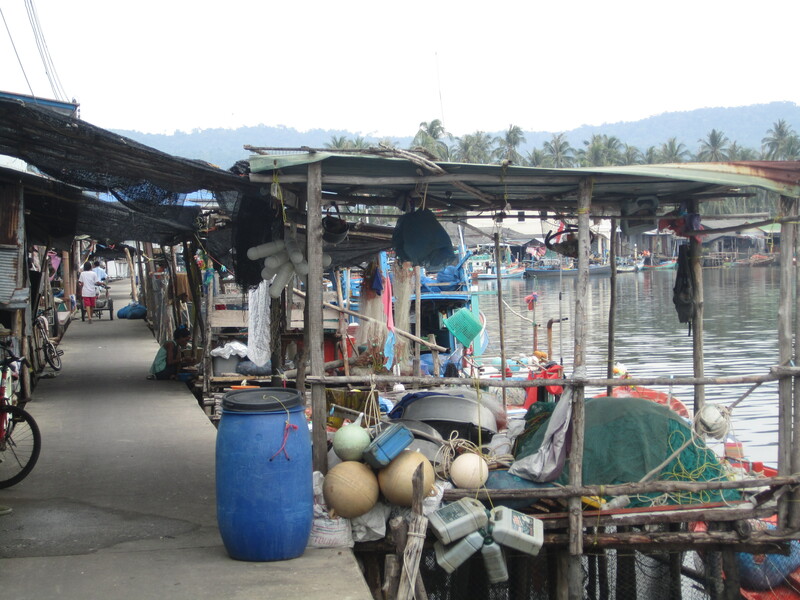 Women sat cutting fish, and men reeled in the nets from painted wooden boats. Dogs sniffed at the sand, littered and muddy; a man picked at the wounds that covered his body, little scabs that spoke of disease and something else, a language I didn’t understand. 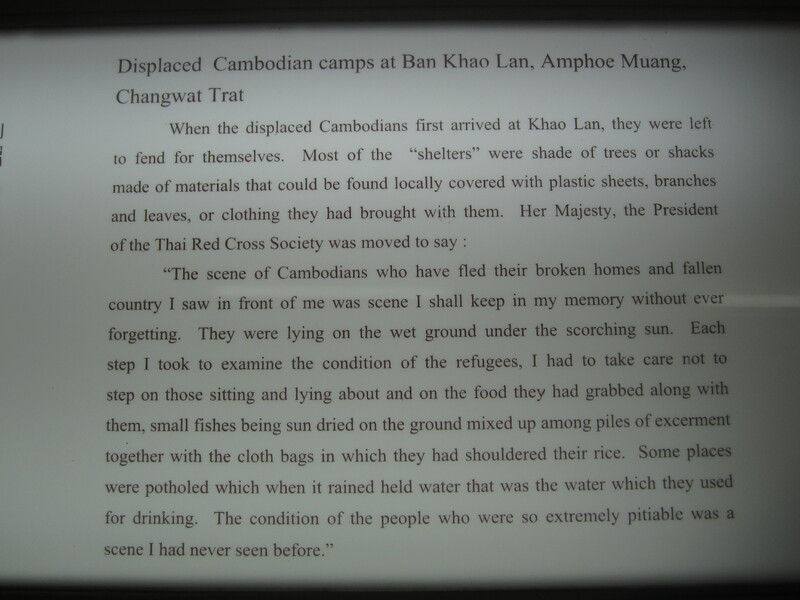 I looked at the faces—many of them were Khmer, obviously Khmer. There’s a brown to pure Khmer skin, while Thai has more of a yellow glow. 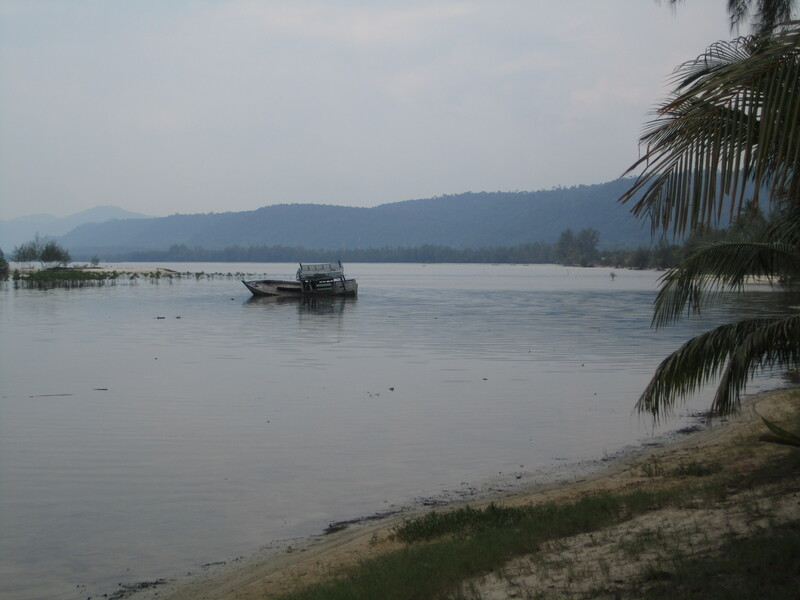 I thought of what the man at the guesthouse in Trat had told me, how a lot of the Cambodian refugees had stayed once their camps had closed, resettled in Thailand. Like him, there were stories trapped in these people—or rather, trapped in the incommunicable space between me and them. They held answers, and if I could have sat with them, listened to them, I could have pieced together an approximation of another story, trapped in a different incommunicable space, the one between live and death—the story I had come to understand. In the picture my friends have from Mai Rut, there’s my friend, a newborn in his mother’s arms. His mother looks like the woman I knew, strong and sturdy and alive, and his father like the man I knew, small and frail and dark. Beside them were two little girls who looked nothing like my friends’ parents—different features, much too dark-skinned. He shrugged. “So what happened to them?” I ask. “No,” he answered kind of far-away, as though the thought had never occurred to him. And I thought of that picture and wondered if I had it, if I could show it to these people, even without a common language, and if anyone would have known or remembered. I wondered what the hell that would accomplish anyway, other than confirming that it had all actually happened. I wondered what the hell I was even doing there, what I was looking for, what any of it was, let alone what it meant. Our pick-up truck bounded down the smooth pavement, creating a muggy breeze. We moved down a strip of the coast, a highway and a shade of green I think I’ll forever associate with Thailand, and that’s the place the people came through. It was 30 years ago and there’s not a lot left—unless you know where to look. 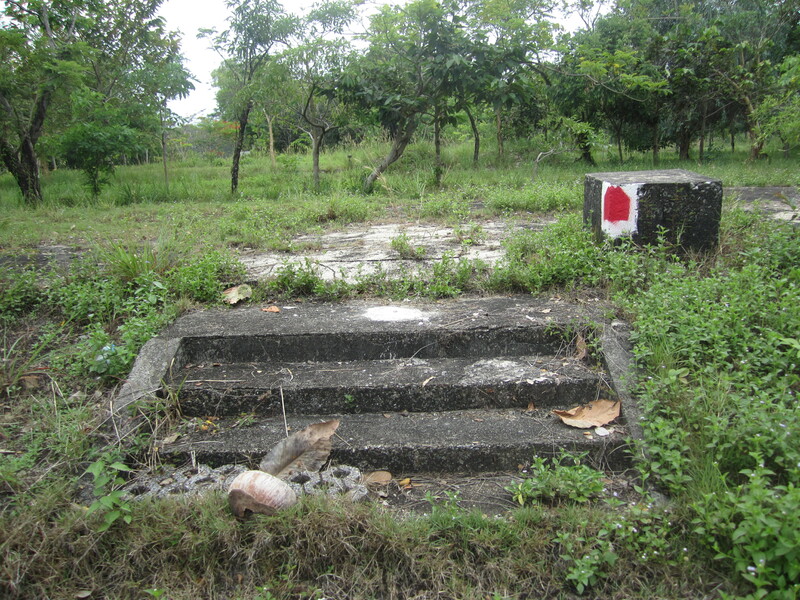 We trundled off, stood on the swampy roadside of a military checkpoint. “Beach?” one of the girls asked me shyly. “Museum,” she repeated softly. The word caused a buzz among her friends. “Museum!” one of them exclaimed assuredly, and pointed to a white structure obscured by the green. 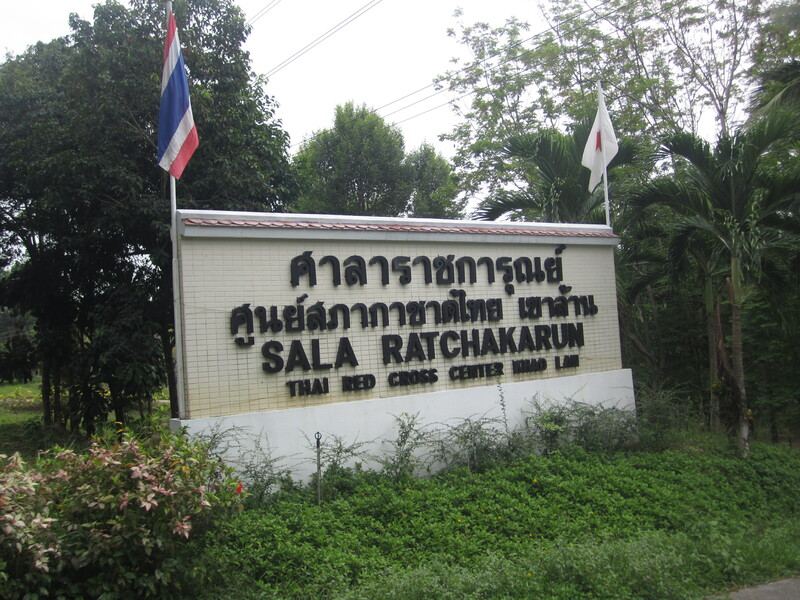 I thanked them with a small bow of my head—I hadn’t learned “thank you” in Thai—and watched them disappear down the road. The museum was modern, diagonal columns and a glass skylight structure that didn’t at all seem to fit the landscape. The adjoining parking lot was empty and the museum gates locked. The guard at the military checkpoint back on the road made an eating motion. He pointed to his watch, held up one finger. I nodded and wandered back down towards the museum grounds, thinking how strangely simple it was, how much you could communicate without words, without a common language, just signs and gestures and hints, a smile and a bow. 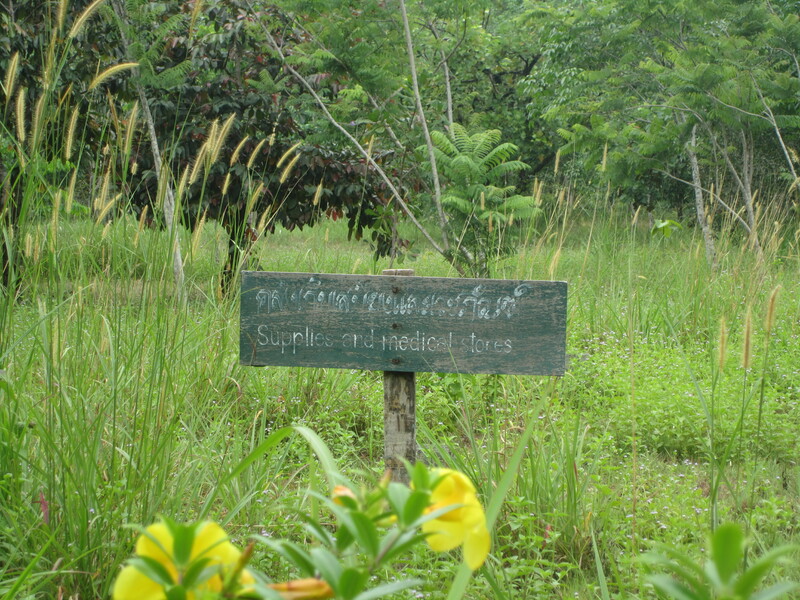 Green signs were stuck amid the grasses, and those communicated a lot less. Were they marking something related to the camp that had once stood there? I couldn’t be sure, but photographed them just in case. I walked deeper into the grounds. A buzz grew from the trees like a living thing, like it weren’t the product of a living thing, a million unseen insects, but an animal in and of itself. It whined and hissed and followed me down the road. There were beaten bits of earth, what had once been a road. Chunks of cement remained, with earth growing back up around it, like a scab before it peels. There were clearings in the grass, and I tried to figure out if they were remains or something used for farming, the stray huts I could spot off between the trees. But I walked further and found translated markers—something, not in a common language, but my language, a scribble I could understand. 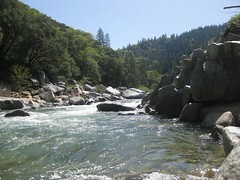 I held my breath and tried to imagine tents and roads and some 90,000 people. I couldn’t. It was just wind and rubble, stairs to nowhere and the earth growing back up around. The museum was open by the time I got back, and I slid off my shoes and stepped inside. A lone female attendant smiled at me and went back to sweeping the floor. The museum was strange. 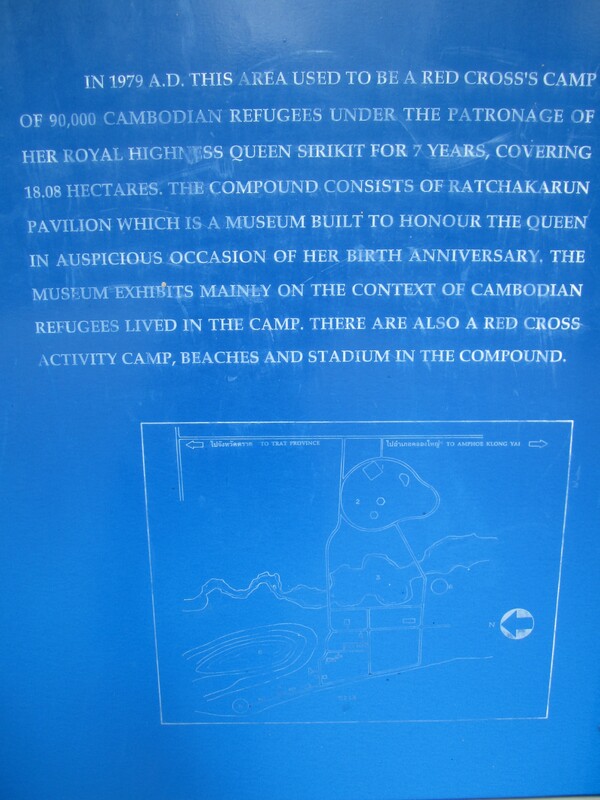 It was mostly a tribute to the Queen, a tribute to her goodwill as evidenced by her selfless saving of Cambodian refugees. Everything was framed in that context—photographs of a glamorous white-skinned woman walking through a city of tents in a white suit, a floppy sun hat and Jackie-O sunglasses. She crouched beside the thin and sick, bellies swollen and eyes dulled, a look of practiced concern. She sat before a group of children, an opened book in her hands: The children listened rapt, the words of the Queen forever imprinted in their minds. Subtext: Thailand is the only country in SE Asia to have never officially fallen under imperalist control. But still, she’d done a good thing, a damn good thing. 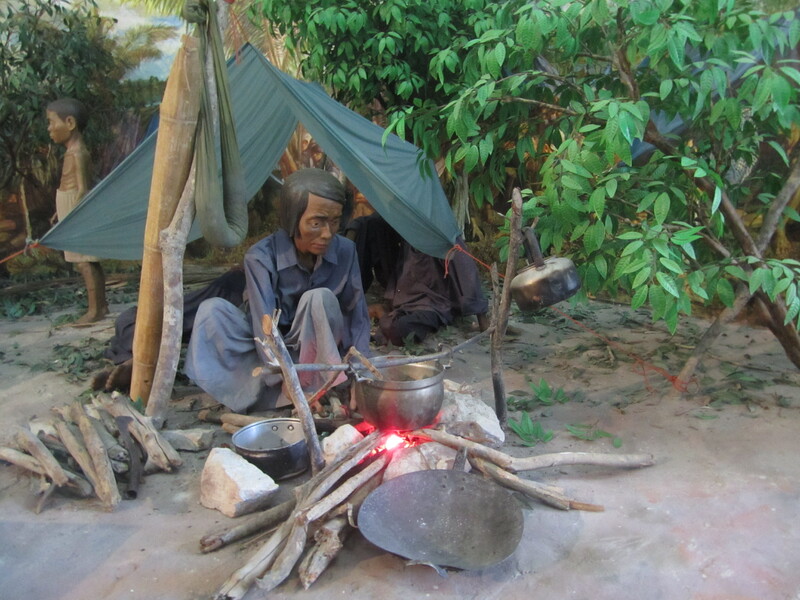 The museum included three life-size scenes that reminded me of wildlife dioramas, the kind my best friend meticulously restores, repainting eyes and gluing on fake fur. 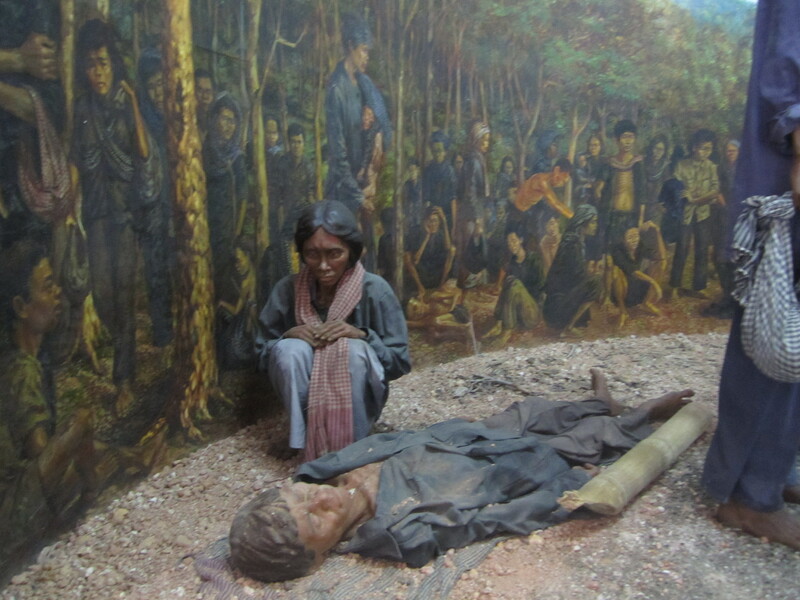 Wax Cambodian figures, their bodies worn and their faces contorted by grief, stood in varying poses of despair, before a painting of thick jungle, more faces and bodies coming through the trees. 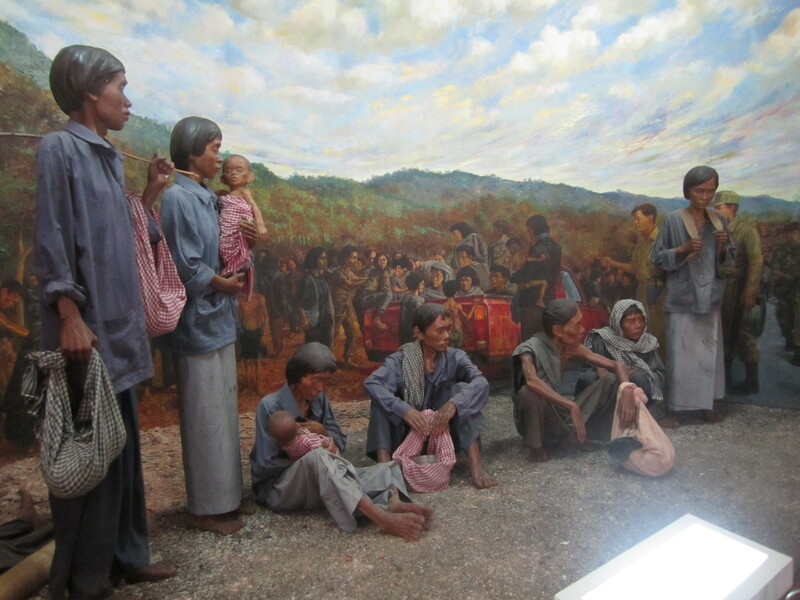 Other scenes depicted varying elements of camp life: cooking pots of rice, a white woman holding a stethoscope to the chest of a small wax infant. 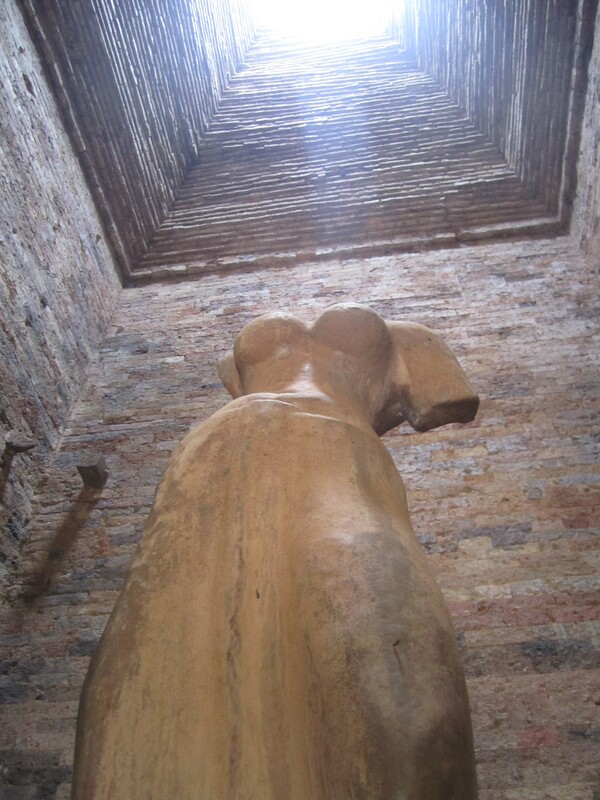 The dark Cambodian bodies grew plumper, more solid. I wondered if that’s what it’d looked like—the emergence from the woods and the camp life. I thought of the newsreel footage of camps I’d seen, the faces in the camps, and decided it was worse. For its oddity and drama, I wondered, if there were any other museums like this, that documented this particular snippet, this part of journey, this freeze-frame from the film reel of a movie you’ve never managed to see all of, keep catching out of sequence or coming in half-way through. I stood barefoot in an empty museum of transience, while the earth outside slowly swallowed the remains of what was left, which wasn’t much at all. I tucked some crumbled bills into the donation box, slid my shoes back on, and stepped out into the heat. "We're on the road to nowhere..."
I rode, blue pick-up truck bouncing, through the lush green and muggy grey of a Thai highway. I was squeezed between a bucket of paint, a woman’s groceries and the soft squirming limbs of two small children. Men stood on rice stacks on the back of the trailer, clutching the grating as the breeze moved through their hair. I was on the local “taxi,” domed trucks with wooden benches in the back, and I was on something of a mission—an anti-mission to find an anti-place, a futile mission to find the What’s Left of a transient moment, blue tents and barbed wire, where babies were born and fates were written in the dusty earth. So it was more than a visa run. 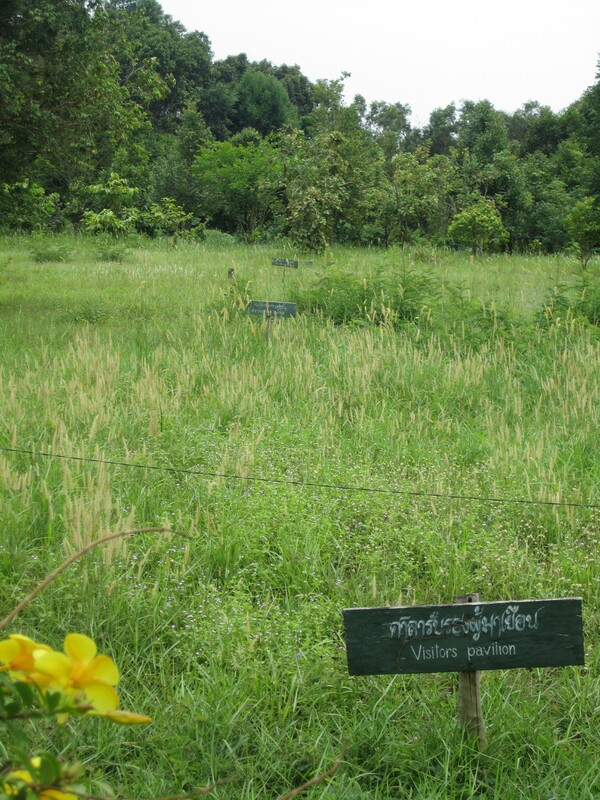 I’d come to the Trat province to find the remains of Mai Rut, a Cambodian refugee camp where my friends’ parents had escaped to, where one of my friends was born. I knew it was a somewhat fruitless endeavor; refugee camps are purposefully made from temporal materials. Still, I wanted to see it, or as close as it I could come to. It was an inbetween point, a turning point, where lives were changed. There’d be little left to find, and that was, I supposed, part of the point. 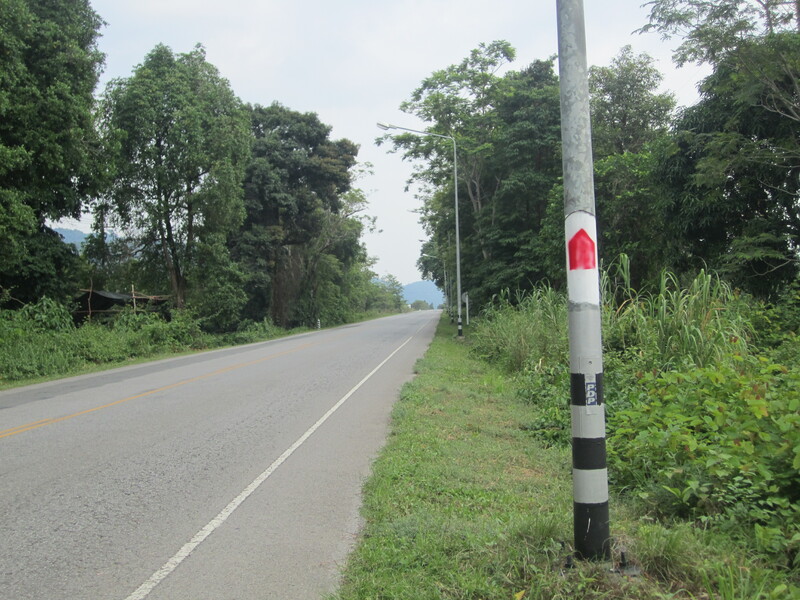 I’d gotten into the town of Trat the night before, still startled by the disparity between Thailand and Cambodia. I found the backpacker area, got a cheap room in a cute guesthouse. 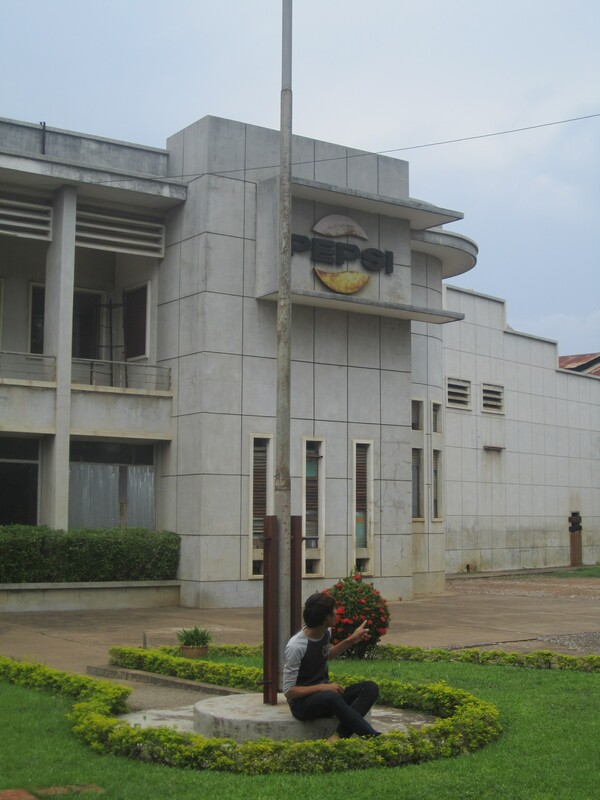 I’d proceeded to wander around, asking every guesthouse keeper and travel agent about where I could hire a tour guide. They looked at me like I was crazy. It was the one time I was ready to throw down some money to hire someone who knew the area, and I was getting nowhere. 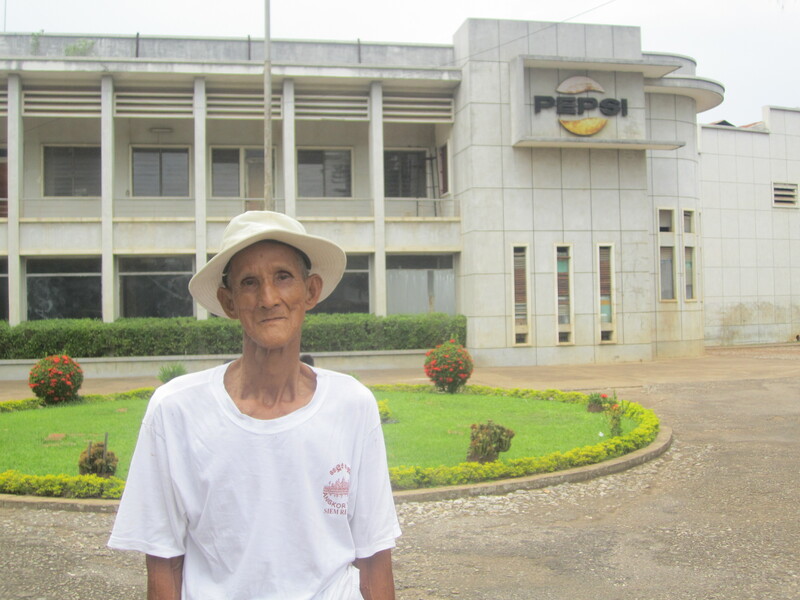 “Why you want to go there?” the man at Pop Guesthouse asked, eying me carefully. He shook his head. “There’s nothing there. Nothing to see.” It was the same answer I’d gotten from everyone else, but it felt like he was holding back. I paused a moment, then shrugged, said thanks anyway, and continued on. I rounded a corner, to the block behind. After walking a bit, the same man poked his head out of a doorway. “Oh, hello again,” I smiled, confused as to how he’d gotten there. “A museum?” I asked, amazed. He nodded. “For the Queen. 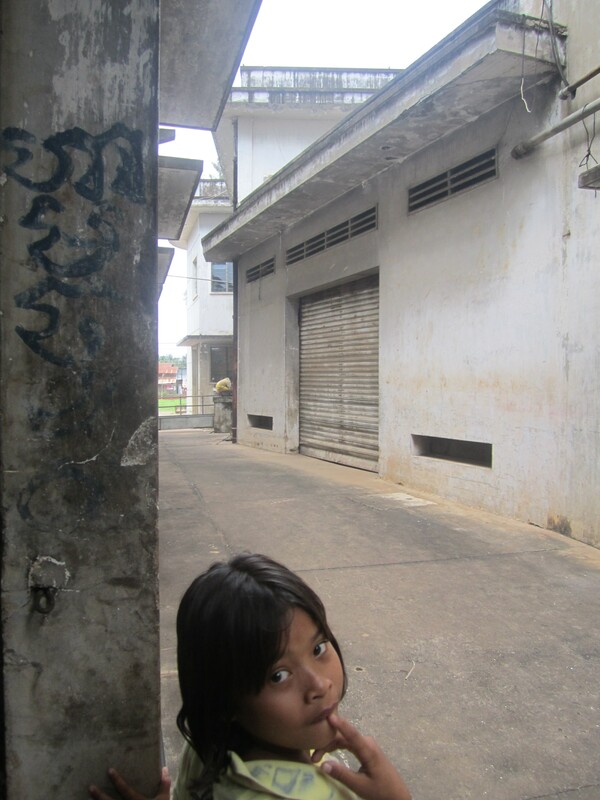 She make the refugee camp for Cambodians.” He explained how to get there, wrote the name in Thai for me in my notebook. I sensed my moment of opportunity. “You were a little boy?” I asked. He nodded again. “Yes, I work on the border then. In my uncle’s orchard.” He pointed to a place right along the black line. “Yes. A lot of people come through the orchard.” He stopped there. I tried to imagine it, to hold some kind of image of what that must have looked, been like—the first foreign eyes to see these people straggle out of four years of unthinkable misery. We stood there in silence. “Most of the camps were up here, right?” I pointed to the Northern border. He nodded again. “Yes, but here, not so many landmines. So it’s better.” He paused again, another muggy silence. 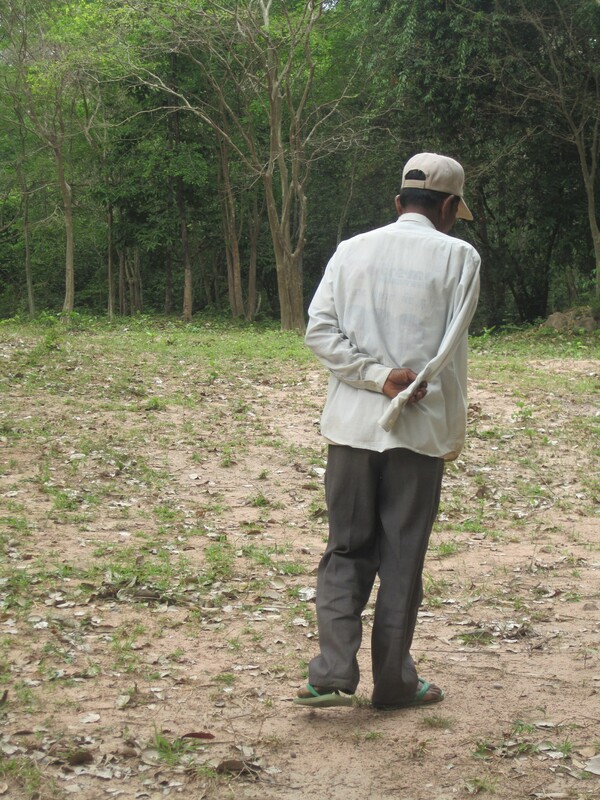 “The people here, they come from Battambang, this way,” he drags his finger across the dim yellow of Cambodia’s eastern edge along the map. I nodded. “Mai Rood, it’s a fishing town. Big town.” I nodded, waiting. 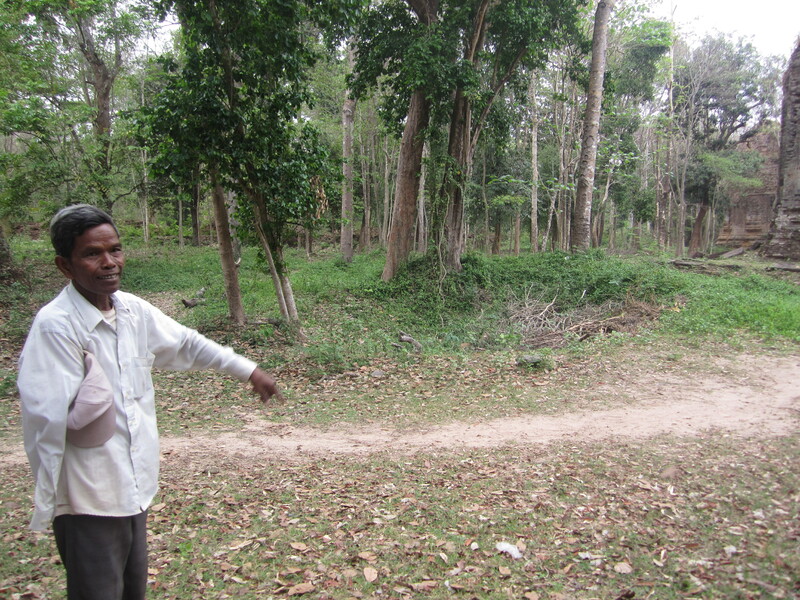 “Many Cambodians live there,” he added briefly. “I have map too. I go look and bring it to your guesthouse. You stay—” and he named my guesthouse. “Yeah,” I responded, amazed. What was this guy, the hospitality ninja? “I see you earlier.” He paused. “Okay,” he folded up his map and smiled. That was it; we were done talking. Of course I wanted to know more. Of course he knew more, more he wasn’t saying. But who was I to ask, to push? I’d already gotten far more than I otherwise would have. I thought about the time it would take to coax the whole story out. I wondered for a moment if he’d ever even told it. Why should he, now, there, with me, a Western girl wandered in from the street? It would take months, I decided—at least that, and I don’t have that now. But if I really want to do this project, and really want to do it right, that’s what it’s going to take. But for now I had all I was going to get. And it was a helluva lot more than I’d come with.